MFR device was evaluated over a period of 1 year (Dec 2012 to Nov 2013) in 31 patients of skin type III-V with Grade 3 and 4 atrophic acne scars. A retrospective photographic analysis of 31 patients treated with MFR for facial atrophic acne scarring was done between November 2012 and December 2013. None of the patients had received any previous treatment for their acne scars. Patients were excluded if they had received treatment with any other lasers during treatment or follow-up period. Thirty-one patients (15 male and 16 female) met the inclusion criteria. The mean age was 27.2 years. 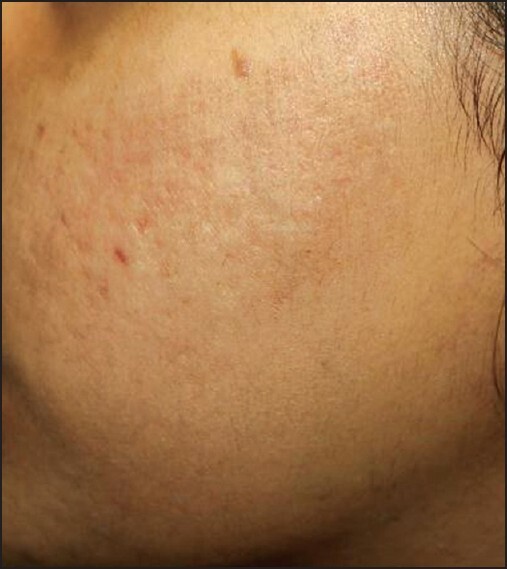 Patients had undergone four sessions of MFR treatment for their acne scars with an interval of 6 weeks between each session, since the time for collagen remodelling lasts around 4-6 weeks. Treatment regimen was individualised based on predominant scar type and scar depth. The procedure area was painted with povidone iodine and cleaned with rectified surgical spirit prior to the procedure. Procedure was performed under topical anaesthesia or nerve blocks, using sterile precautions. Penetration depth was limited to 1.5 mm on forehead, temple areas and areas with bony prominences. Patients with predominantly ice pick scars and mixed scarring were given a needle depth of 3.5 mm on the first pass, 2.5 mm on the 2 nd pass and 1.5 mm on the 3 rd pass with minimal or no overlapping. Higher energy settings (35 W-40 W) at depths of 3.5 mm with successively lower energy levels (30 W-35 W, 25 W-30 W, respectively) were used at lower penetration depths to prevent epidermal coagulation. Post-procedure pain was managed by oral non steroidal anti-inflammatory drugs (NSAIDs) for 2 to 5 days. Patients were advised strict sun protection along with re-epithelizing agents containing cyclopentasiloxane, cyclohexasiloxone and sodium hyaluronate. All patients completed the study, including the 3-month follow-ups. Most patients had mixed types of atrophic acne scars, including ice pick, boxcar and rolling scars. MFR was associated with substantial improvement in the appearance of all types of acne scars, which included the softening of scar contours as well as reduction in scar depth. Estimation of improvement with Goodman and Baron's Global qualitative Acne Scarring System was done. Out of 31 patients who completed the treatment, 14 patients had Grade 4, 17 patients had Grade 3 before treatment. The physician's assessment of response to treatment based on Goodman and Baron Qualitative scar grading system is summarised in [Table 3]. In patients with Grade 4 scars, 12 patients (85.71%) showed improvement by 2 grades, i.e. 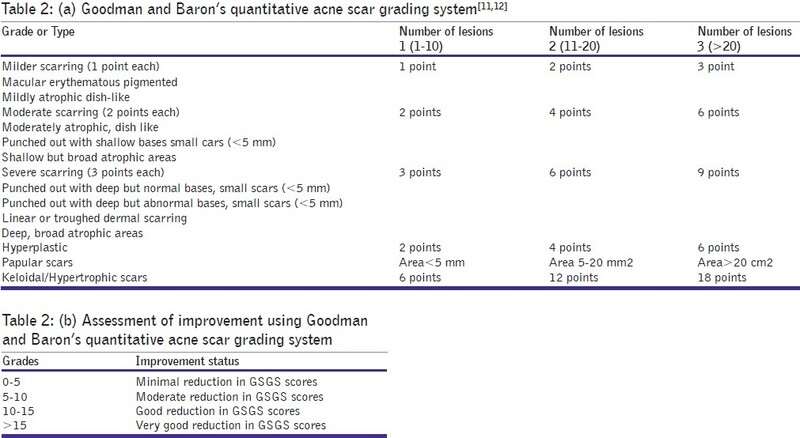 their scars improved from Grade 4 to Grade 2 of Goodman and Baron scale [Figure 1]a and b. Two patients (14.28%) with Grade 4 scars showed improvement by 1 grade with scars being obvious at social distances of 50 cm or greater. In 17 patients with Grade 3 scars, 13 patients (76.47%) improved by 2 grades [Figure 2]a and b and 4 patients (23.52%) showed improvement by 1 grade [Figure 3]a and b. Rolling and box scars showed better response than ice-pick scars. Estimation of improvement with Goodman and Baron's Global quantitative Acne Scarring System showed that 58% of the patients had moderate improvement, 29% had minimal improvement, 9% had good improvement and 3% showed very good improvement [Figure 4]. The treatment was generally well tolerated. All patients underwent treatment-related pain. All patients had reported mild erythema for two days, two patients had oedema for more than three days, five patients reported post inflammatory hyperpigmentation and two patients had track marks of the device probe [Figure 5]. Social activity could commence as early as one day after treatment. In contrast to ablative and non ablative lasers, treatment with the MFR device can be controlled by varying the depth. A microneedling fractional radiofrequency (RF) device is available for commercial use (Lutronic corporation USA) with a maximum energy output of 50 W and capable of delivering energy in increments of 2.5 W in 20 equally graded energy level settings (Level 1-2.5 W to level 20-50 W). The ability to set multiple needle depths per pass is an advantage, allowing discrete electrothermal coagulation at different layers of the dermis. The insulated needles prevent electrothermal damage from occurring anywhere in the dermis but at the very tip of the needle and never in the epidermis. Despite these differences both studies show that fractional radiofrequency is both safe and effective for treatment of acne scars in skin types 3, 4 and 5. The encouraging results prompted us to conduct retrospective analysis of efficacy and safety of MFR to treat atrophic acne scars in patients of Indian ethnicity, skin type 4 and 5. Estimation of improvement with Goodman and Baron's Global qualitative Acne Scarring System showed that in 14 patients with Grade 4 scars, 85.71% showed improvement by 2 grades, 14.28% showed improvement by 1 grade. In 17 patients with Grade 3 scars, 76.47% improved by 2 grades and 23.52% showed improvement by 1 grade. Of the 31 patients with Grade 3 and Grade 4 acne scars, 80.64% showed improvement by 2 grades and 19.35% showed improvement by 1 grade. Rolling and box scars showed better response than ice-pick scars. Estimation of improvement with Goodman and Baron's Global quantitative Acne Scarring System showed that 58% of the patients had moderate improvement, 29% had minimal improvement, 9% had good improvement and 3% showed very good improvement Hence, all 31 patients (100%) showed improvement in their scars with no failure rate. The treatment was well tolerated with transient side effects such as mild erythema, post-inflammatory hyperpigmentation and track marks of the device. MFR treatment can be considered as an effective modality of treatment for moderate to severe acne scars in patients with an added advantage of minimal downtime and effective improvement. 1. Holland DB, Jeremy AH, Roberts SG, Seukaran DC, Layton AM, Cunliffe WJ. Inflammation in acne scarring: A Comparison of the responses in lesions from patients prone and not prone to scar. Br J Dermatol 2004;150:72-81. 2. Slavin JW. Trichloroacetic acid peels. Aesthetic Surg J 2004;24:469-70. 3. Orentreich DS, Orentreich N. Subcutaneous incisionless (subcision) surgery for the correction of depressed scars and wrinkles. Dermatol Surg 1995;21:543-9. 4. Alkhawan L, Alam M. Dermabrasion and microdermabrasion. Facial Plast Surg 2009;25:301-10. 5. Hirsch RJ, Cohen JL. Soft tissue augmentation. Cutis 2006;78:165-72. 6. Grevelink JM, White VR. Concurrent use of laser skin surfacing and punch excision in treatment of facial acne scarring. Dermatol Surg 1998;24:527-30. 7. Hu S, Chen MC, Lee MC, Yang LC, Keoprasam N. Fractional resurfacing for the treatment of atrophic facial acne scars in asian skin. Dermatol Surg 2009;35:826-32. 8. Chrastil B, Glaich AS, Goldberg LH, Friedberg PM. Second generation 1550 nm fractional photothermolysis for treatment of acne scars. Dermatol Surg 2008;34:1327-32. 9. Gold M, Biron J. 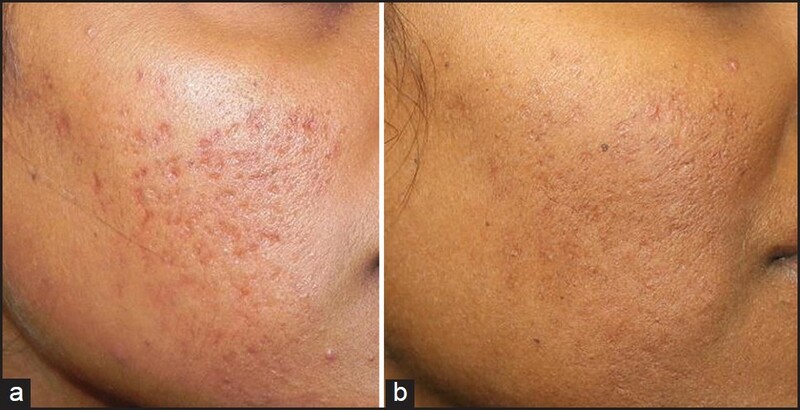 Treatment of acne scars by fractional bipolar radiofrequency energy. J Cosmet Laser Ther 2012;14:172-8. 10. Hruza G, Taub AF, Collier SL, Mulholland SR. Skin rejuvenation and wrinkle reduction using a fractional radiofrequency system. J Drugs Dermatol 2009;8:259-65. 11. Goodman GJ, Baron JA. Post acne scarring: A qualitative global scarring grading system. Dermatol Surg 2006;32:1458-66. 12. Goodman GJ, Baron JA. Postacne scarring: A quantitative global scarring grading system. J Cosmet Dermatol 2006;5:48-52. 13. Goodman G. Management of post acne scarring: What are the options for treatment? Am J Clin Dermatol 2000;1:3-17. 14. Rivera A. Acne scarring: A review of current treatment modalities. J Am Acad Dermatol 2008;59:659-76. 15. Tan J, Vasey T, Fung K. Beleifs and perceptions of patients with acne. J Am Acad Dermatol 2001;44:439-45. 16. Jacob C, Dover J, Kaminer M. Acne scarring: A classification system and review of treatment options. J Am Acad Dermatol 2001;45:109-17. 17. 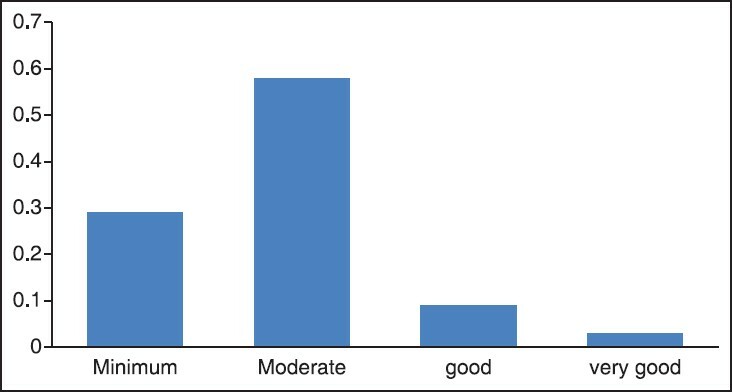 Jordan R, Cummins C, Burls A. Laser resurfacing of skin for improvement of acne scarring: A systematic review of evidence. Br J Dermatol 2000;142:413-23. 18. Munavalli GS, Weiss RA, Halder RM. Photoaging and non ablative photorejuvenation in ethnic skin. Dermatol Surg 2005;31:1250-60. 19. Calderhead RG, Goo BL, Lauro F, Gursoy D, Savant S, Wronski A. The clinical efficacy and safety of microneedling fractional radiofrequency in the treatment of facial wrinkles: A multicenter study with the INFINI system in 499 patients [WWW document]. 2013. Available from: www.lutronic.com/.../infini (free article). 20. Ramesh M, Gopal M, Kumar S, Talwar A. Novel technology in treatment of acne scars: The matrix tunable radiofrequency technology. J Cutan Aesthet Surg 2010;214:46-51. 21. Cho SI, Chung BY, Choi MG, Baek JH, Cho HJ, Park CW, et al. Evaluation of the clinical efficacy of fractional radiofrequency microneedle treatment. In acne scars and large facial pores. Dermatol Surg 2012;38:1017-24.